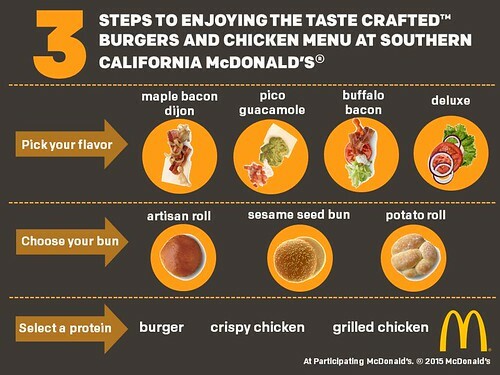 LOS ANGELES (November 30, 2015) – Responding to consumer requests for variety and personalization, McDonald’s® restaurants in Southern California are introducing Taste Crafted Burgers and Chicken. These new menu items allow customers to create a sandwich the way they want by pairing one of four new flavor bundles with their choice of proteins and buns. Starting with a choice of 100% USDA inspected beef, Buttermilk Crispy Chicken or Artisan Grilled Chicken, customers then have a choice of a sesame seed bun, potato roll or artisan roll. Once the protein and bun are selected, customers can choose one of the four fresh flavor options, including Pico Guacamole, Buffalo Bacon, Maple Bacon Dijon and Deluxe. For those looking to spice up their sandwich cravings, there is the Pico Guacamole build with fresh Pico de Gallo and guacamole, savory ranch sauce, white cheddar and lettuce or the Buffalo Bacon build with blue cheese spread, spicy buffalo sauce, Applewood-smoked bacon, tomato and shredded lettuce. To add a sweeter side to meal time, the Maple Bacon Dijon build offers crispy maple bacon, grilled onions, Dijon sauce, white cheddar and lettuce. Those who love a classic can opt for the always satisfying Deluxe build with red onion, mayo, lettuce and tomato. To celebrate, McDonald’s of Southern California fans can follow @McDonalds_SoCal on Twitter for several upcoming activations with opportunities to win one-of-a-kind prizes. Additional offers and specials can be found on the new McDonald’s Mobile App, available for download on Apple and Android phones. Must be 13 years or older. Data rates may apply. Visit McDonalds.com/app for terms and conditions. The McDonald’s Operators’ Association of Southern California (MOASC) is comprised of more than 600 franchised and company-owned McDonald’s restaurants in Los Angeles, Orange, Riverside, San Bernardino and Ventura counties. For more information download the McDonald’s Mobile App or follow us on Twitter: @McDonalds_SoCal.